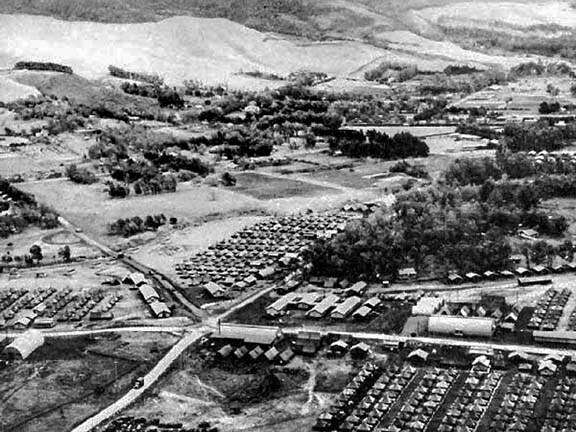 For information on the new Camp Tarawa "Boots on the Ground" tour go to Camp Tarawa Tour in the index bar at top of the page. Morning colors 2nd Marine Division-Camp Tarawa 1944. 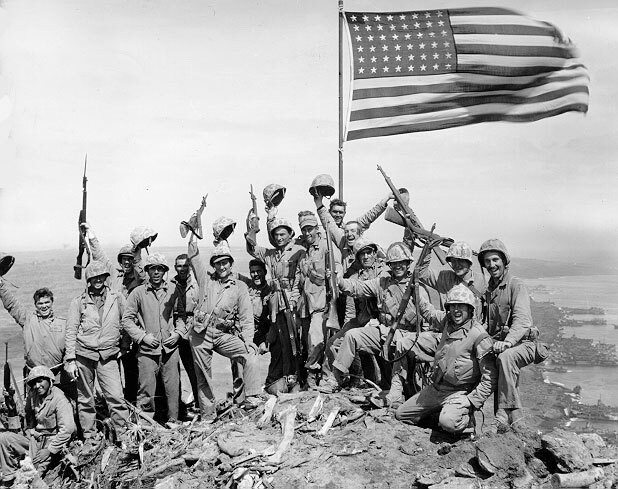 Marines and Navy Corpsman from Easy Company 2nd Battalion 28th Marines after raising the flags on Mt. 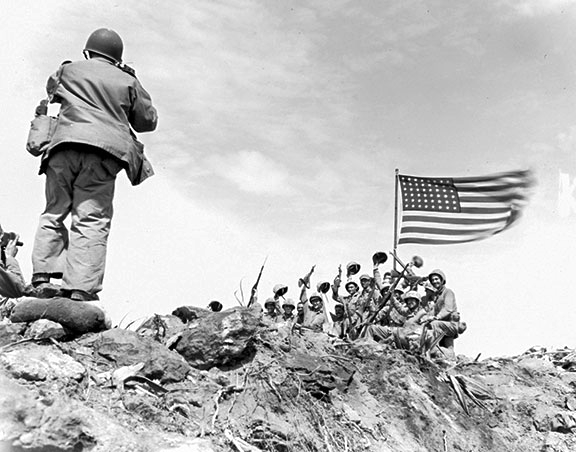 Suribachi-Iwo Jima February 23, 1945. 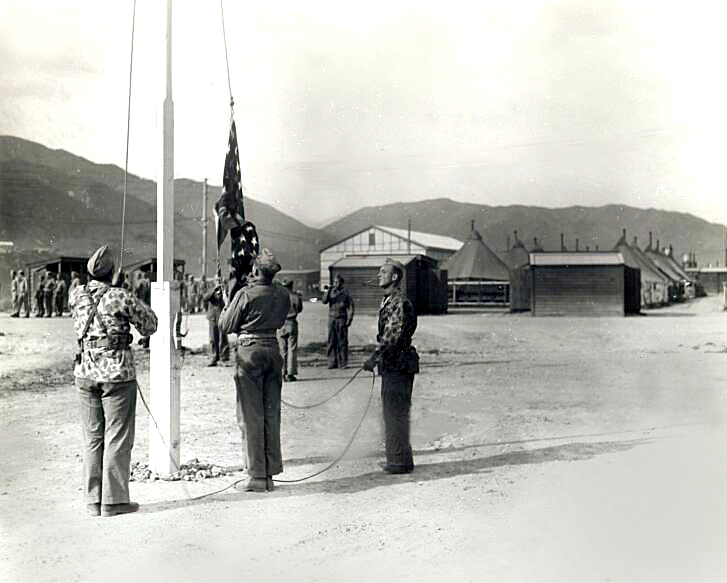 Our detachment short history of old Camp Tarawa is now available in PDF format and can be be downloaded to your PC or Mac. It can be printed out or read on your PC or Mac monitor. If you are interested in receiving a copy by email please contact Kathy Painton at kathypainton@hotmail.com . For some old Camp Tarawa History check out these pages on the index bar at the top of this page, 2nd and 5th Division for letters written by Marines that trained at Camp Tarawa, Roscoe's page for Sea Stories, and the Monument page for the history the Camp Tarawa Memorial. Our next scheduled meeting is on Saturday, April 27, 2019 at VFW Post 12122 in Kailua-Kona. Social Hour begins at 11:30am and our business meeting starts at 1:00pm. Dress code is Resort Casual. Kathy Painton (808) 880-9880 (kathypainton@hotmail.com) for more information. We start all our meetings with "On October 6, 2006, after more than 61 years, Marines and Navy Corpsmen have returned to Camp Tarawa." 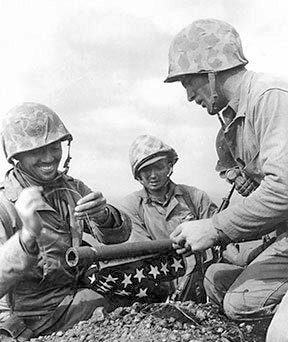 Our Primary Mission: To keep alive the history of the men of the 2nd and 5th Marine Divisions who trained at old Camp Tarawa from December 1943 until the Camp was closed in November 1945 after the invasion of Iwo Jima. Of the 55,000 Marines, Navy Corpsmen and Seabees who trained at Camp Tarawa, a total of 5,145 were killed in action or died of their wounds. 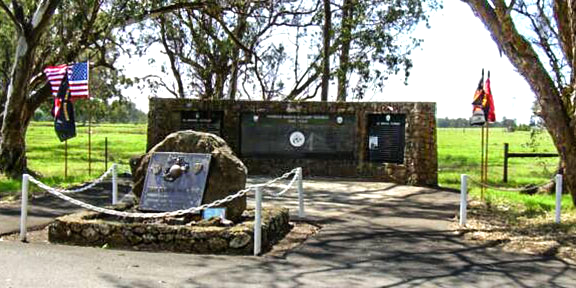 18,029 were wounded in action in the invasions of Saipan-Tinian and Iwo Jima. Keeping this history alive is important because of the sacrifices they made in defense of our nation during WW II for our generation and generations to come. This is our way of thanking them! 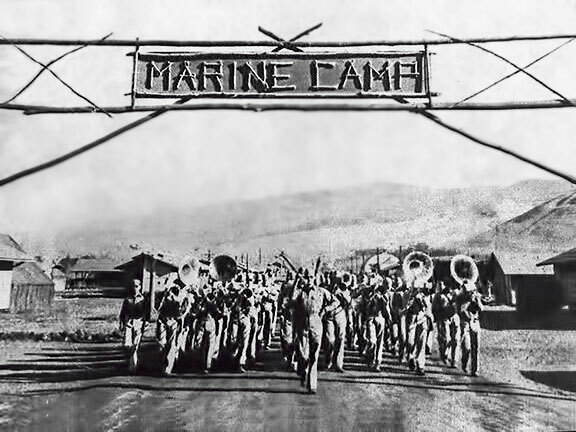 5th Marine Division band was led by Bob Crosby, Bing Crosby's brother. 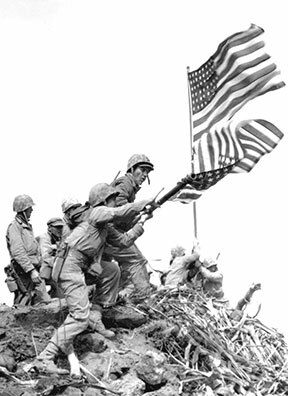 In the raising of the Stars and Stripes on Mount Suribachi, Camp Tarawa on the Big Island of Hawaii played a secret and important roll in the battle for Iwo Jima. “Here the ground sloped down toward the center of the volcanic crater, and I found that the ground line was in my way. I put my Speed Graphic down and quickly piled up some stones and a sandbag to raise me about two feet (I am only 5 feet 5 inches tall) and I picked up the camera and climbed up on the pile. I decided on a lens setting between f-8 and f-11, and set the speed at 1-400th of a second." From Joe Rosenthal. 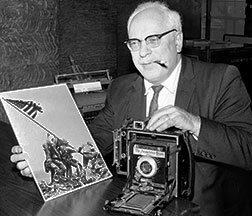 Feb. 23, 1945: It had been four days since the AP’s Joe Rosenthal landed on the Pacific island of Iwo Jima. The hail of Japanese fire had not let up. During one of the bloodiest battles of World War II, U.S. Marines captured Mount Suribachi, a volcanic peak on the southern tip of the island. Jubilant, they raised a flag. Rosenthal trudged up the mountain. He learned that the Marines planned to substitute a larger flag that could be seen all over the island. “I thought of trying to get a shot of the two flags; but I couldn’t line it up. 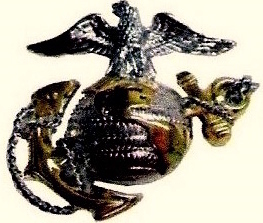 I decided to get just the one flag going up.” Marines milled about. 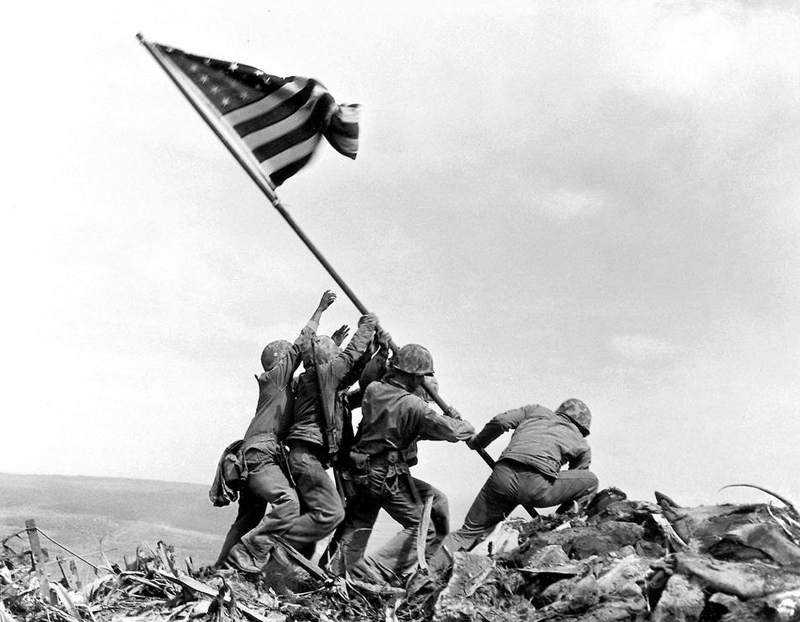 Suddenly, “out of the corner of my eye … [I saw] the men start the flag up.” He swung his bulky Speed Graphic and captured the most enduring image of the war. Speed Graphic which captured the image.